No garden is to small to grow some vegetables or herbs, and a kitchen garden is a way to grow your own food. A kitchen garden is simply a place where you grow food to eat, you could call it a vegetable patch, however it is really ease of access that makes it the kitchen garden in todays terms. How to build a Kitchen Garden. You can create a kitchen garden in a number of ways. A simple hand dug area. Growing herbs and vegetables in Pots or containers also works. Its a matter of looking at space, location and also resources. A simple dug garden is always the cheapest. Why grow vegetables and herbs ? A great way to become involved in gardening is to start a Kitchen garden, every one love to eat fresh food, so the idea of growing you own can easily be achieved with little cost and effort. Kitchen garden design can be as simple as placing a few pots of useful herbs close to the back door or planning and building a series of raised garden beds that will allow a wide range of herbs, vegetables and fruit trees to be planted and crops rotated as required. A kitchen garden can include composting facilities, worm farms and even an outdoor sink for washing produce. We provide some basic ideas for planning and designing a kitchen garden. proximity to the kitchen, a kitchen garden close to the kitchen, with easy access will get more use than one that is located a long way away. large or small garden beds, remember that access is the key to any garden, wide garden beds are difficult to manage, try something no more than a meter across. You will need to draw up a basic plan of the area that you have to work with. Consider the width of any garden beds for access and also consider costs. A basic ‘dug’ bed is the cheapest. Pots are next and then raised garden beds. However they all serve different purposes and have their own advantages and disadvantages. Best plants for kitchen gardens. Espaliered Fruit trees for saving space. Raised Garden Beds for a Kitchen Garden. 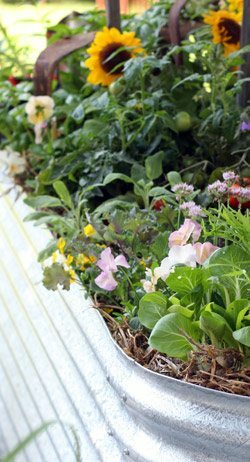 Kitchen gardens lend theme selves to raised garden beds, and with raised garden beds the alternatives are growing each year. Substantial masonry (brick) garden beds have been used for many years, however timber, corrugated iron and even recycled PCV are all all alternatives. Consider modular kitchen gardens, readily available online or from nurseries, some of these even come with watering systems and small igloos (hothouse) that allow the gardening season to be extended.